Brewing with total confidence. The details make the difference between an average batch of home brew and a truly excellent brew that is repeatable. 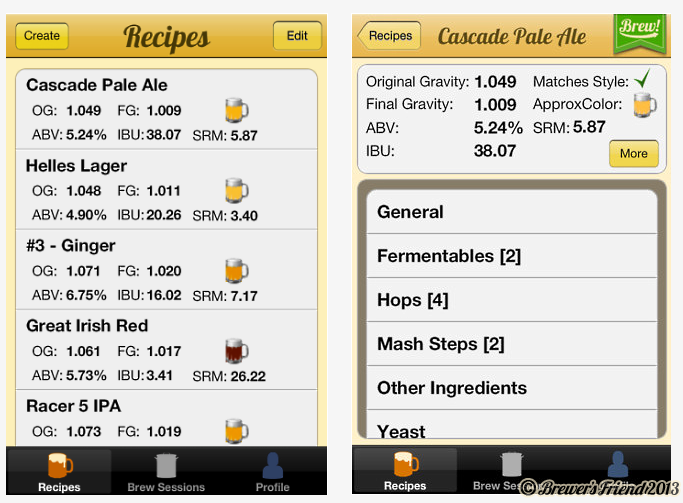 This app is a beer recipe calculator, brew session tracker, and brew log – all on your iPhone. 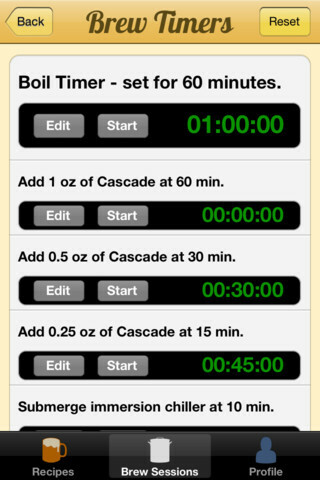 We offer a fully featured iPhone app which supports recipes, brew sessions, brew logs, and brew day timers. The fully featured app is also capable of syncing with our cloud (requires premium account). The forum is our preferred way of addressing questions, comments, and concerns. We have a dedicated section in the forum for the iPhone app. The contact us page is also available if you wish to get in touch with us directly. A premium account is required to take advantage of the sync to the cloud feature. The reason we require a premium account is the 5 recipe trial limit would interfere with sync capabilities since the iPhone allows unlimited recipes and brews internally. Stand alone calculators are next on our list. Shopping list and inventory sync are also part of the roadmap. Please comment on what you would like to see in the forum. Update 11/6/2013 – The Brewer’s Friend Yeast Pitch Calculator 1.0 is now available on the App Store! This is a port of our popular web based Yeast Pitch Calculator, now available for iPhone iOS7. Update 9/12/2013 – The Brewer’s Friend iPhone app version 1.7 is now available on the App Store! The 1.7 release adds 70 new yeasts! Brands include: East Coast Yeast, Mangrove Jack, Real Brewers, Siebel Institute, and Brewferm. Two new stand alone calculators: Plato/Brix -> Specific Gravity calculator, Dilution and Boiloff Calculator. Ability for extract and partial mash brewers to set ‘kettle’ or ‘fermentor’ batch size target. Update 8/6/2013 – The Brewer’s Friend iPhone app version 1.6 is now available on the App Store! The 1.6 release adds several new stand alone calculators – strike calculator, abv calculator, hydrometer correction, and priming sugar calculator. They can be used stand alone (new tab at bottom). A filled out recipe has links to them so you don’t have to retype fields. Update 7/24/2013 – The Brewer’s Friend iPhone app version 1.5 is now available on the App Store! The 1.5 release adds support for: hop stands (whirlpool and hopback hop uses), recipe CO2 level field, milliliters as unit in other ingredients section. Improves recipe listing view (shows snapshot indicator, index added). Update 6/8/2013 – The Brewer’s Friend iPhone app version 1.4 is now available on the App Store! The 1.4 release addresses an iTunes sync bug, sorts recipes/brews, and adds UI enhancements. Update 5/31/2013 – The Brewer’s Friend FREE iPhone app version 1.0 is now available on the App Store! This fully functional version of Brewer’s Friend contains all of the features of the full version, except it is limited to two recipes, two brews and sync is not available. Great way to give the full app a whirl before buying it. Update 5/10/2013 – The Brewer’s Friend iPhone app version 1.3 is now available on the App Store! Brew session and brew log sync with the Brewer’s Friend cloud is supported (requires premium account). iPhone 5 now fully supported as well! Timers now play sound when they go off. 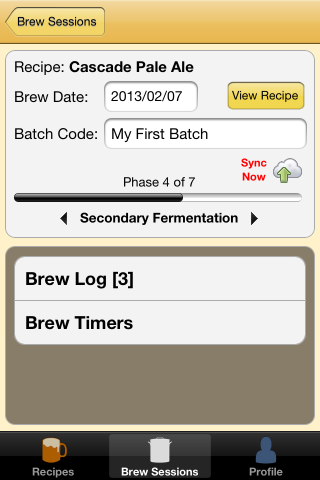 Update 4/12/2013 – The Brewer’s Friend iPhone app version 1.2 is now available on the App Store! Recipe sync with the Brewer’s Friend cloud is supported (requires premium account). The reason we require a premium account is the 5 recipe trial limit would interfere with sync capabilities since the iPhone allows unlimited recipes internally. Update 3/4/2013 – The Brewer’s Friend iPhone app version 1.1 is now available on the App Store! 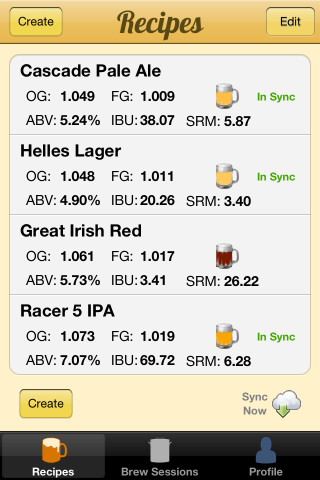 Update 2/16/2013 – The Brewer’s Friend iPhone app is version 1.0 is now available on the App Store! Version 1.0 is out. This initial version supports recipe creation and a basic brew feature with logs. The plan is to build towards feature equivalency with the cloud application (inventory, shopping list, etc) and support data sync between the two. We are working on 1.1 which will include a custom brew timer designed for iPhone. The groundwork for the data sync has also been built into the backend. The price is currently $5.99. As it is, we feel it is competitive with other apps out there, and it will only get better! Eventually we will raise the price after data sync and a few other features are built in. If you buy now, you will be locked in at the low price!